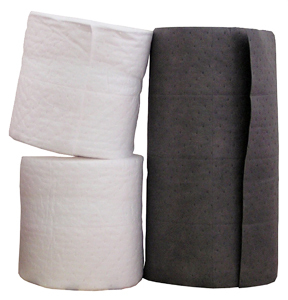 Use Laminated Rolls when you need a rugged and durable absorbent for long-lasting applications. Laminated Rolls have an outer layer of tough spunbond material that resists abrasions and tears. Laminated Rolls can withstand rough handling and won't tear apart when positioned under equipment. The lamination makes these rolls virtually lint free. They are perforated for maximum versatility. Tear off only what you need and save money. 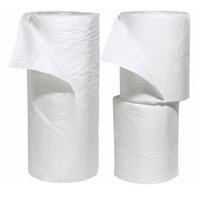 You can purchase a full roll that is 30" wide or a split roll that gives you two 15" sections. Available in Oil Only (White) or Universal (Gray) medium thickness. Choose Oil Only Laminated Rolls to absorb hydrocarbons such as oil, gas, diesel, hydraulic fluid, jet fuel. Choose a Universal Laminated Rolls to absorb most liquids such as water, chemicals and oils.